The Law Offices of Jason Turchin represents many victims of airbag malfunctions or defect claims. If you believe you were injured by in airbag or a loved one was killed as a result of an airbag, call me for free consultation at 800-337-7755, or submit your case information for your airbag claim online. Here are some samples of the airbag claims we have handled or currently represent the victim or the family. Every case is unique, and past results do not guarantee future success. We can evaluate each case individually to see if you have an airbag claim. The victim of a car accident was allegedly injured after his airbag exploded. The emblem from the Mercedes airbag cover flew off and burned his arm. Immediately after the accident, the victim was seen at the emergency room with a clear visible image of the Mercedes symbol branded on his arm. The victim may require surgery to repair the wound and will likely have a life long scar on his arm as a result of the alleged airbag malfunction or defect. The Law Offices of Jason Turchin was retained in September 2013 by a victim of a car accident whose leg was stabbed by a 4 inch piece of metal that shot out of his airbag in the 2006 Dodge Charger. 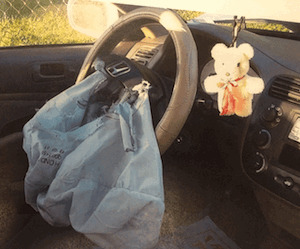 In what may have been a typical low-impact car accident in Miami, the victim was seriously injured when the airbag exploded and sent shrapnel into the driver area. In this case, both Chrysler and Takata, the manufacturer of the airbag, may be liable for manufacturing or design defects in the airbag. Our office also was retained by another victim of an airbag shrapnel injury in a 2001 Honda Civic. The victim was driving a 2001 Honda Civic when she struck another vehicle at moderate speed. Her driver's side airbag deployed and a piece of thick metal, approximately 2 in. x 1 in., flew through her airbag and struck her in the forehead just an inch above her eye, fracturing her sinus cavity and causing other serious injuries to her face. The airbag had a hole in it with burn marks around the area where the piece apparently tore through before striking our client. The piece of metal that struck our client displayed signs of corrosion. Our airbag attorneys also represent another victim injured by shrapnel when she was driving a 2001 Honda Civic and was involved in a t-bone type of accident. Upon impact, the vehicle's passenger-side airbag exploded. A piece of the airbag caught fire and landed on her body, causing burns. The airbag unit also broke free from the dashboard, flew through past the front seat of the car and landed in the backseat. It showed signs of burn mark. The car had melted areas on the dashboard and seat handle where the burning shrapnel touched. Our client was injured when her airbags went off without any accident. Among her injuries, she sustained airbag burns and bruises. After a car accident which should have resulted in minimal injuries, our client sustained fractures to her wrists. The airbag deployed with too much force and caused severe injuries to our client. A recent filing by representatives of airbag manufacturer Takata disclosed that they may have been aware of situations in which the airbag could deploy with a greater force then normal and may lead to more severe injuries then they are designed to sustain. We represent other victims of accidents whose airbags did not deploy in a high impact, high-speed accident. Under the situation and circumstances of these car accidents, we believe the airbags should have deployed. Although sometimes there are issues with the sensors which trigger the airbag deployment, recent reports and documents filed by representatives of Takata, one of the leading airbag manufacturers, suggests that issues with the airbag itself and ammonium nitrate used as an explosive in the airbag may cause the airbag not to deploy in the event of a car accident. if you have a question on a potential airbag case, please do not hesitate to call airbag attorney Jason Turchin for free consultation. We are happy to speak with you to see if you have a claim against Takata, or any of the car manufacturers including Honda, Chrysler, BMW, Lexus, infinity, Ford, GMC, Dodge and others. Call Airbag Attorneys at the Law Offices of Jason Turchin at 800-337-7755 for a free airbag case consultation. Open late and on weekends!